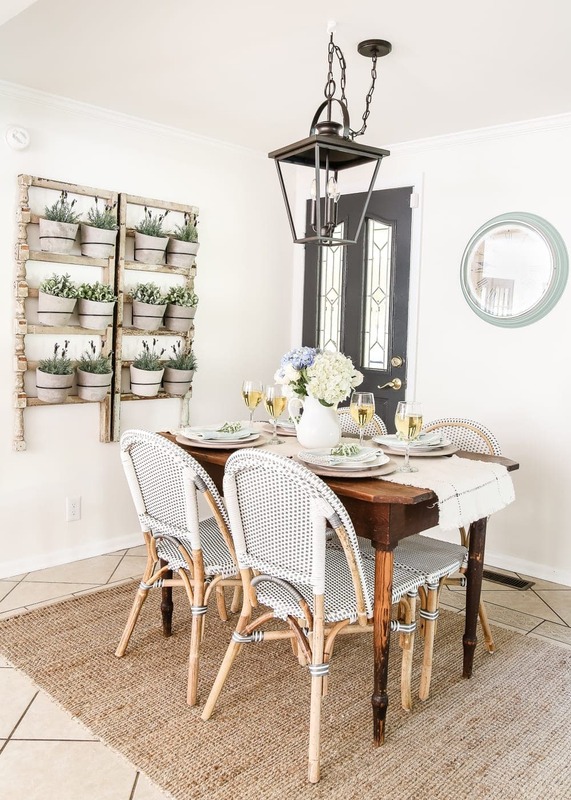 A summer home tour with modern French farmhouse style using inexpensive decorating tricks and ways to stretch your dollar to look luxe on a budget. There isn’t much that a bundle of supermarket flowers can’t fix. That’s pretty much what I’ve decided in the midst of spilling coffee and diffusing temper tantrums and sitting in traffic running late for preschool for the um… 4th day in a row. Flowers are the unsung hero of any hot mess kind of day, even if sometimes we just buy them for ourselves. 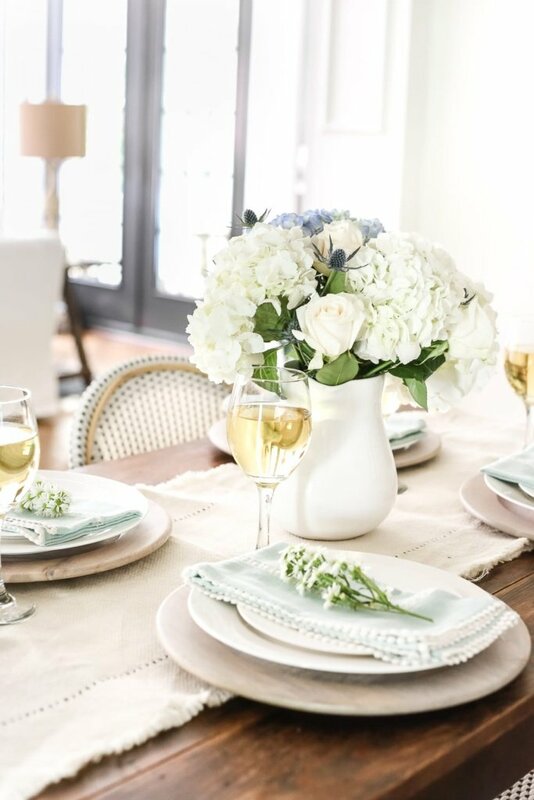 My pitcher of Walmart flowers and I are so excited to be joining up with Gina from Shabby Creek Cottage and a group of incredibly talented bloggers for the Summer Tour of Homes 2017. I’m not even going to pretend like you just rang my doorbell and I answered in my best June Cleaver outfit with pumps and pearls to sweep you into our spotless breakfast nook for a cup of coffee. Because generally, if company shows up unannounced, I’m dumping dishes in the sink and tossing toys in closets and shoving laundry in rooms you can’t see. So I hid all of the dirty laundry just for you today. Feel special. 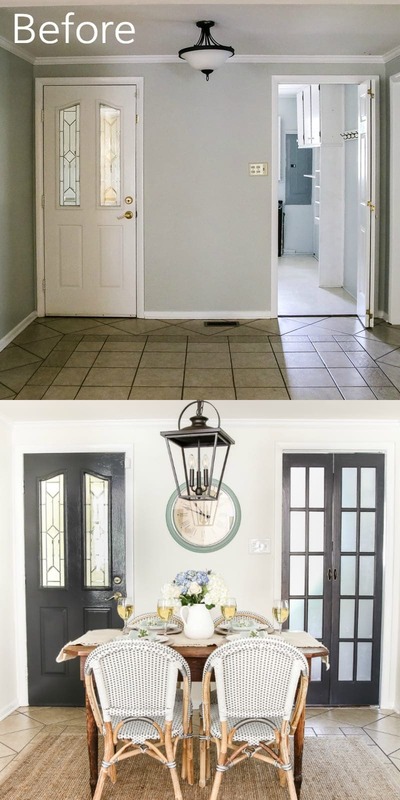 If you don’t usually follow this little blog of mine, about a month ago, my husband Robert and I closed on our new-to-us 1960 Colonial house in the suburbs of Charlotte, North Carolina, so this spring has been much more hectic than usual with lots of painting and makeovering and more adulting than I’ve done in years. 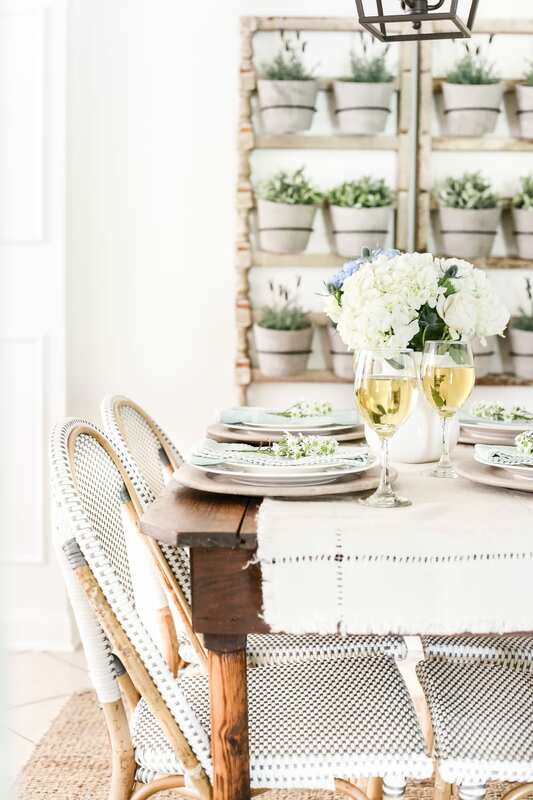 This summer, I’m so ready for a bit of a slow-down, so we kept the summer decor on the simple side. With all we’ve had going on lately, I really wanted to keep our home calm and peaceful for this time of year. Sometimes a pitcher of flowers is all you really need to brighten an entire room. 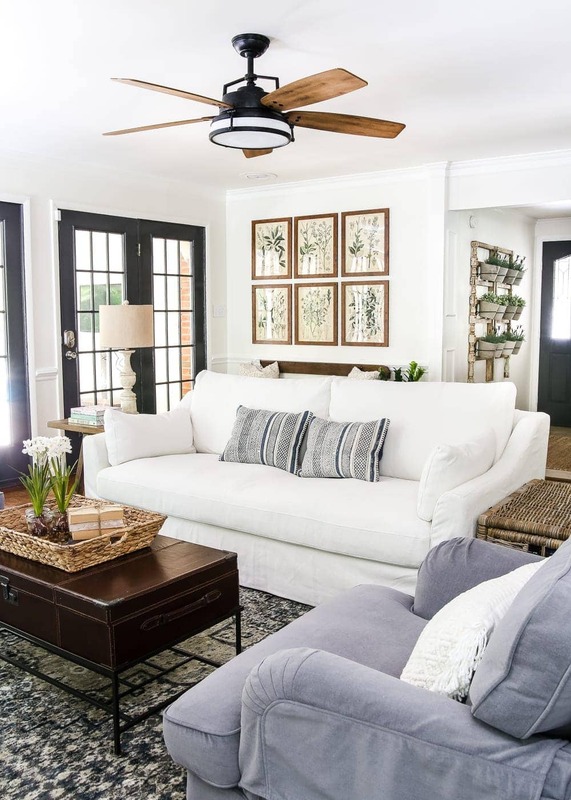 We’ve been painting our little hearts out to make it a space that reflects more of our style, which somehow is starting to lean toward the modern French farmhouse side. We still have a little ways to go, but I’m amazed how far we’ve come. Once June hits, our house usually sees a couple of cookouts per month until September, so I know this space is going to see a whole lot of action very soon with friends and family visiting. I love that it’s a space that feels quaint and elegant yet still like we can put our elbows on the table. We scored this antique farm table for $110 on Craigslist, which we plan on giving a little makeover to freshen it up soon. I always love using banged up tables because it means my 4 year-old and I can color and sprawl out with craft projects and give it even more “character” without having to baby it. I also found these French bistro chairs for $75 each on TJMaxx.com recently that are so cute and comfy but still durable against Olivia’s spills at mealtime. They’re meant for outdoors but who says you have to obey the rules, right? Our living room is still a work in progress, but I’ve kept it fairly simple so far with just this pair of blue print pillows. (They usually end up on the floor anyway. Why fight it?) You can see more about the transformation of this room here. We’ve absolutely loved our IKEA furniture for movie nights lately since we’ve had a regular round of evening thunderstorms. It’s one of my absolute favorite things to hear the rain pattering on our roof while snuggling up as a family with giant bowls of chocolate ice cream. 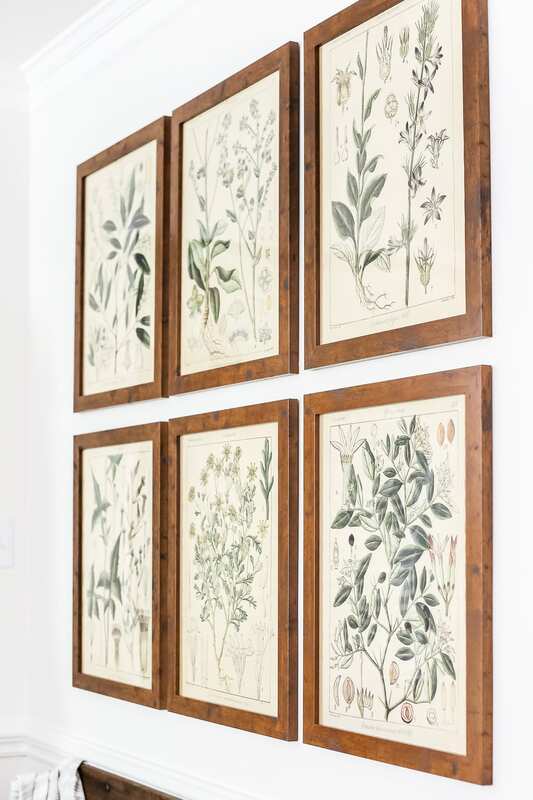 Last week, I shared this set of botany printable art that I framed in these wood-look plastic poster frames. You’d never know how inexpensive they are! Now that we have a pool right outside of our back door, I’m sure this spot will be filled with beach towels and flip flops and chaos for the next few months. I’m so excited for it, mess and all. 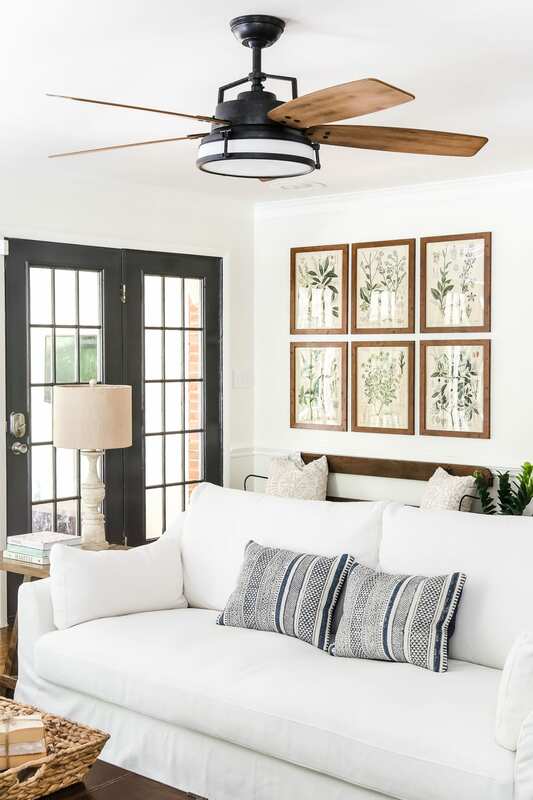 You can see the whole lineup of the Summer Tour of Homes below, which you definitely won’t want to miss! Thank you so much for popping in for a visit! I hope your summer is a little bit of relaxation, a little bit of chaos, and when it gets to be a little bit stressful, buy yourself a bundle of supermarket flowers just because. You have done so much in a short space of time. Hope you have a wonderful Summer in your new house. I was hoping there would be a link to the table runner. Where did you purchase it? I got the table runner at World Market a couple of years ago, but unfortunately it’s been discontinued. 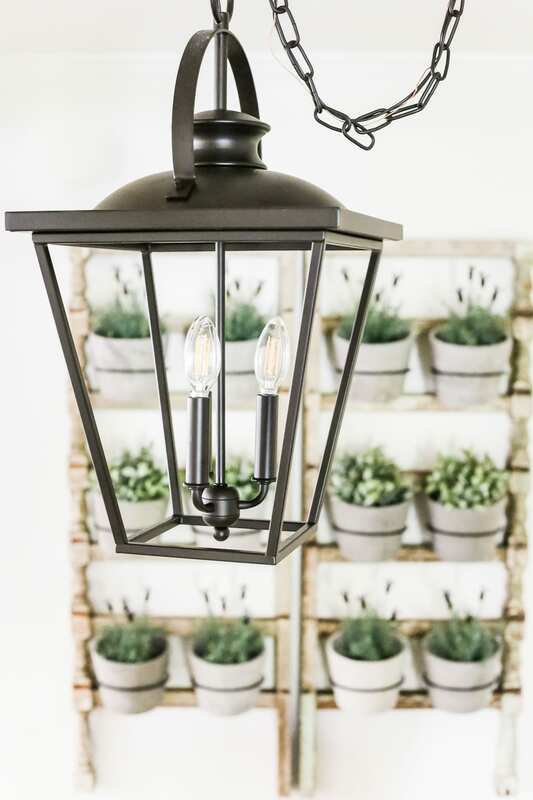 There is one similar to it at Pottery Barn but of course it’s like 3x the price I paid. Booooo. 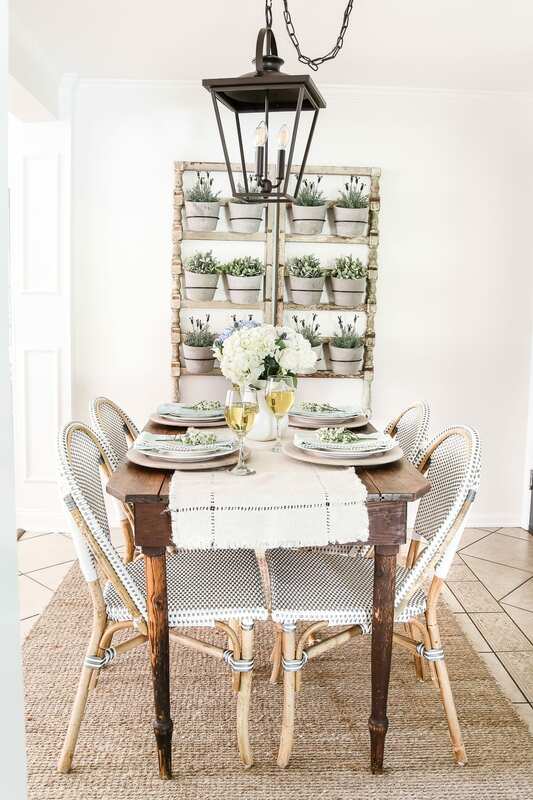 Here’s the Pottery Barn one similar to it: http://rstyle.me/n/cnq2kzb5ky7 I’m sure you could buy a couple yards of ivory burlap at a fabric store and cut it as a runner for the same effect. All that hard work is paying off, everything is coming along SO beautifully! LOVE seeing your style evolve and can’t wait to follow along with this newest adventure! Thank you so much, Kristi!!! Everything is perfect Lauren. But what grabbed my eye was the “table” in the living room. I will wait patiently for you to discuss this at some time in the future. It is unique with loads of character. I hope you are enjoying your new home! I too noticed the living room coffee table as being particularly beautiful! 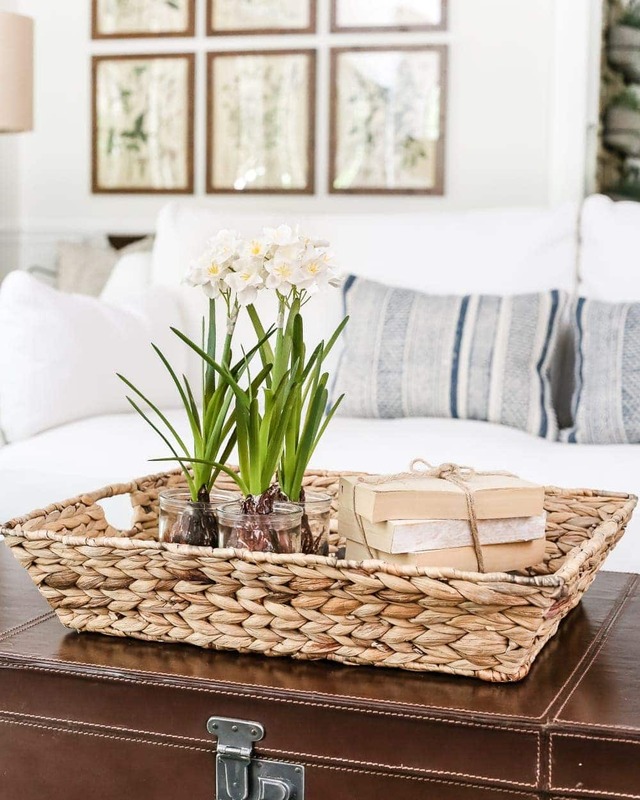 Your spaces are so light and airy! And I love the flowers! Congrats on the remodel! So happy to be on the tour with you! Did you DIY the laundry room doors? Recover existing doors? If so….please share how it was done!!! Love them!!!! Hi Paula! We took down the existing bifold laundry room door because it was broken and replaced it with this French style bifold: http://amzn.to/2rahO1n We primed it first since it was unfinished raw wood and painted with two coats of Benjamin Moore Wrought Iron to match the rest of our doors. 🙂 We chose to have frosted glass to hide any mess that is usually in our laundry room but it still lets in natural light from a window in there. Well done!! Your house is coming along nicely. Love all the pictures. Oh my Lauren, you have been so so busy! Congratulations on your new home! How thrilling to make it your own. I really am amazed how beautiful your home looks for just moving in! LOVE the lantern!!!! And your colors! Beautiful!!!!! Looks great Lauren. Hope you can all slow down soon and enjoy your new home. Love watching the progress of your new home, Lauren. You have everything looking beautiful! Really enjoyed being on the summer tour with you! Wow, I can hardly believe what you’ve accomplished in such a short time. Great job – everything looks lovely! What a pretty tour! 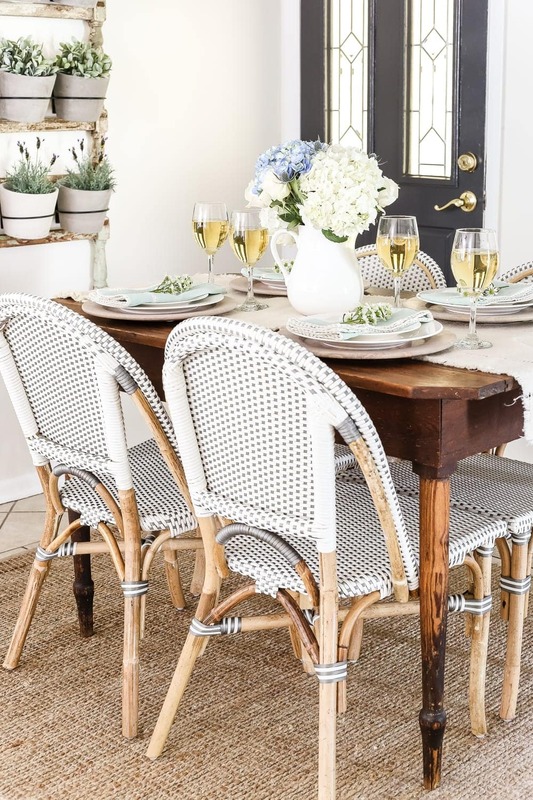 I love those bistro chairs, what a steal to find them for that price. Those botanical prints are lovely too- thanks so much for sharing! Yikes. You eat chocolate ice cream while sitting on white furniture??? 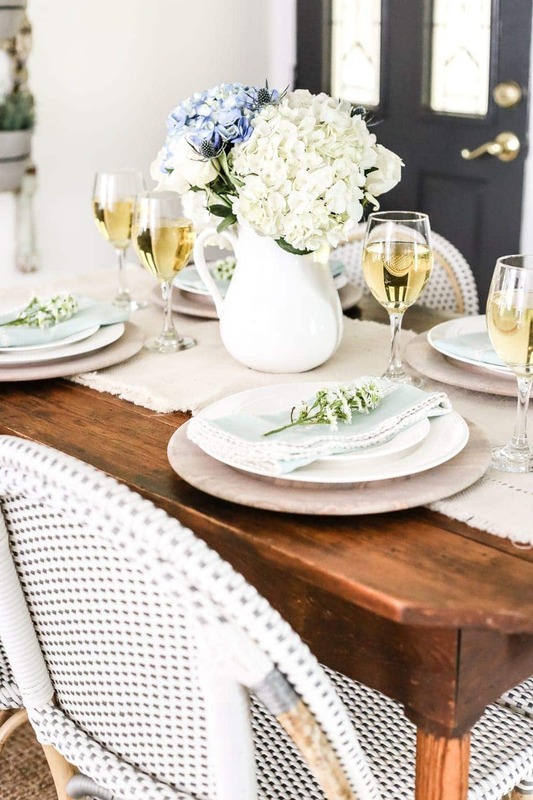 Seriously though – kidding aside- your spaces are looking absolutely dreamy awesome. It is all coming together so beautifully! I love the fake foliage, I kill any plant I get my hands on. lol. It would take too much space to comment on everything so I’ll just say you’re doing a fantastic job and your excitement comes through in your posts. ? Love watching the new house be transformed into your home. Everything looks so cozy! I’m wondering how you handle lamps when they’re away from the wall, like the one next to your sofa? Do you have an outlet in the floor? What to do with the cords?? I’m so glad to hear you’re enjoying it, Tracey! We’re having a lot of fun with it. Yes, we have an outlet in the floor there, thankfully. In our last house, we had to run our lamp cord all the way to the wall and it was always getting knocked over. Total pain! Your home is lovely! Do you mind sharing what website you found the botanicals on? I printed out the botanicals and got the same frames! They look lovely in my house and yours! Thank you! So glad to hear that, Laura! Hi – I apologize if this is a duplicate comment, but I cannot get the link to the ceiling fan to work. Would you be able to resend the information on it? Thank you! The changes you’ve made look so pretty! 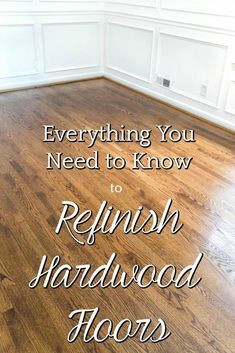 Did you do anything to the parquet floor or was it already stained that color? It looks so much better than the 70’s honey color that I have from the original homeowner that’s the same shade as our golden retriever! Thanks for sharing your process! Thank you! We haven’t done a thing to the floors. Thankfully, they’re already dark. They have a slight orange tone to them, so I’d still like to have them refinished. But it’s not enough for me to want to tackle it right now. My, my, everything you touches turn out breathing gorgeous. I love what you did here. Where did you get the blue chairs in the living room? They are perfect! I love your ceiling fan. Can you please share where you found it? Beautiful home! What paint color did you use on the walls? And trim? Hi Dani! The wall color is Benjamin Moore Swiss Coffee and the trim is Benjamin Moore Simply White. I love all your posts! We’ve done most of our window trim now based on your blog :). Not sure my husband is glad I found you though :). We just finished a bank of 3 windows very similar to the one you did. It looks SO much better. Such a great, inexpensive and immediate impact. I can’t wait to do all my windows. Question… I looked at your planter post and I can’t find the plant holders anywhere based on the links provided. Did you find them anywhere else in your research? I’ve been wanting to do something similar. 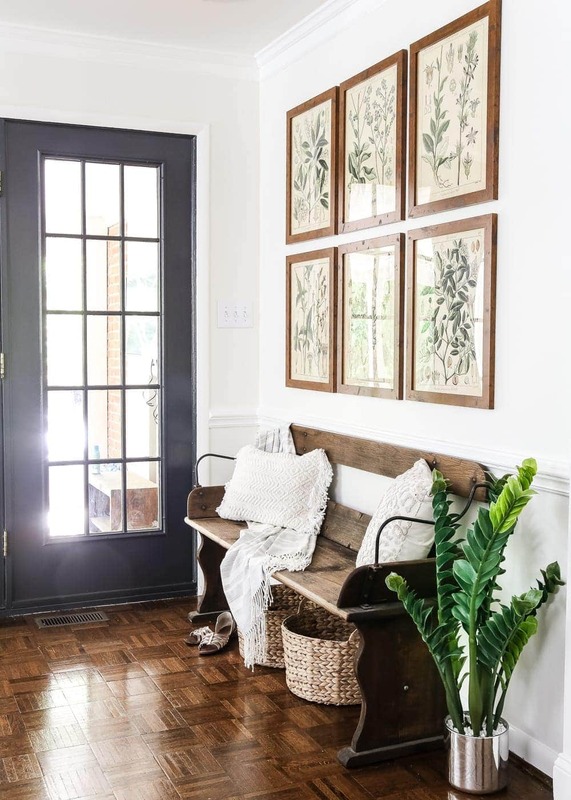 Can you share paint colors you used on walls and doors? They are lovely. Hi Cielo! The walls are Benjamin Moore Swiss Coffee, trim is Ben Moore Simply White, doors are Ben Moore Wrought Iron. Where did you find your entry bench? Hi PJ! It’s Benjamin Moore Swiss Coffee. It has a slight creaminess I just love! Can you tell me where you actually purchased the fake wood frames? Hi Andrea! Yes, the frames are from Michael’s. They go on sale every so often for around $10-$15 each. They’re plastic but look exactly like wood, even in person. You can’t tell until you reach out and touch them. Hi Joka, the doors are painted Wrought Iron by Benjamin Moore in semi-gloss. No, nothing like that. I just email the seller on Craigslist, ask when would be a good time to come see it / pick up, and my husband and I truck it to the person’s home to load it ourselves. I ALWAYS bring him with me as a safety precaution. Are your chairs in the living room “Stocksund” from Ikea? They look very similiar—and attractive! Everything is so beautiful! I especially love your dining room table – I don’t know if I’d change it, it’s lovely as it is. After seeing your brass turned white candelabras, I’m thinking your chandelier would look great done the same way. You are so talented! Plus I just love your style. Hi Lauren!!! Your house is stunning, would you mind sharing where you purchased your table lamp from? Thanks, Stephanie! It’s from Kirkland’s.